Chef Day, is a French and Italian gourmet cuisine trained Chef from Haiti.Trained under the direct mentorship and tutelage of Michelin Star Chefs experienced in Fine dining and fast casual dining; nutrition and Culinary instruction. Her insatiable curiosity and passion for fine dining allows her to blend fresh and bold ingredients with tactful culinary techniques to create nutritious, flavorful and artfully plated dishes often inspired by her Caribbean roots. I'd be Elated if you joined me for brunch Sunday, February 10th from 1PM-4PM! I will be serving a buffet inspired by the Italian coast infused with Caribbean flavor dressed with delectable treats, scrumptious morsels and surrounded by thoughtfully curated details made to whisk you away to the Amalfi Coast of Italy in a private space in TriBeCa New York City. Our menu features a six-course buffet furnished with lots of added extras such as fresh fruit, pastries, and cured meats to which you're welcome to have seconds and thirds! We will also be featuring a signature bottomless mimosa for the afternoon and an assortment of Italian wines. The cost of brunch is $135 per person reservations are open until Friday, February 8th 2019. 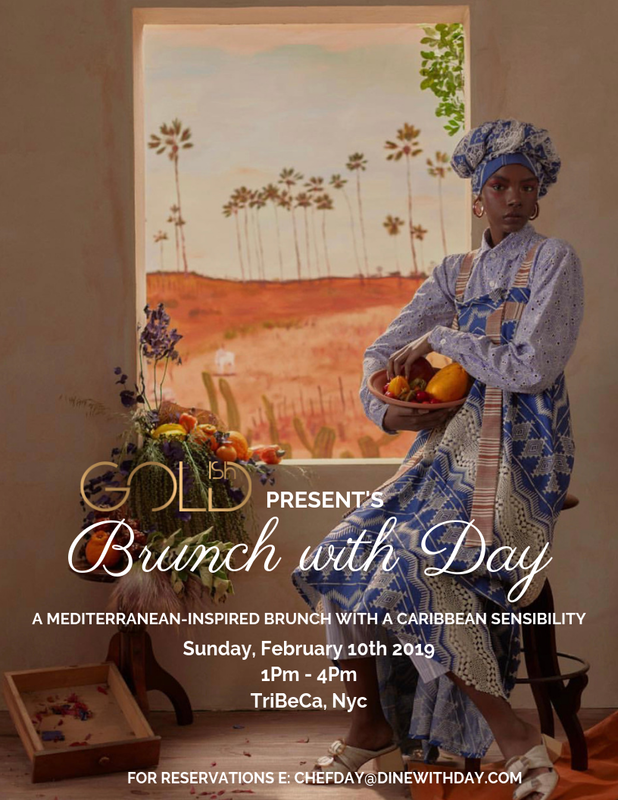 Lavish in an afternoon of Serenity and color, while enjoying a live serenade from New York Metropolitan Opera's own Tenor Jordan W. Pitts, an innovative photo session where you can adorn yourself in jewelry from Goldish. Come dressed in your Sunday's best and commune with like minded individuals for a brunch experience that invokes conversation, curiosity, and community. It would be my pleasure to have you dine with me. To reserve your seat(s) please send the total payment for your party via the desired digital platform (Paypal, CashApp, or Venmo) by clicking the link below. Please send Paypal payments “Friends and family”. Please include the name(s) of the person(s) in your party as well as your email to receive your confirmation.